You deserve the best Amazon sourcing software available. "Viral Launch's Product Discovery blows Jungle Scout out of the water... no doubt about it." Viral Launch has completely blown Jungle Scout out of the water. I no longer use Jungle Scout in any shape or form. I've completely left them and joined Viral Launch. “Wow, I just found 7 profitable products, all over 30K profit, in 2 hours. You've got to get Product Discovery. It blows Jungle Scout out of the water, no doubt about it. It's night and day." Jungle Scout offers the Product Database (Products) and Niche Hunter (Keyword). While the Product Database is a good way to get product ideas in front of you, it's not a great way to measure market potential. The Niche Hunter is a good idea in theory, but the keywords often don't make sense and have unrealistic sales numbers. There are many different ways to arrive at potential products. It is essential to trust the numbers you rely on for your sourcing decisions. Estimates sales based on the average BSR over time by capturing an hourly average BSR, and then adding up those daily estimates for the monthly sales estimate. This accounts for vast fluctuations... running a promotion or going out of stock won’t skew the estimates. Estimates sales based on the BSR right now, showing you a brief snapshot. This widely varies from day to day, and even hour to hour. Looking at a product’s sales estimates in the morning may be completely different than the evening. Imagine trying to predict the entire plot of a movie by looking at one still frame… it’s almost impossible to get right. To know where an Amazon product market is going, you must know where it it is now and where it has been. 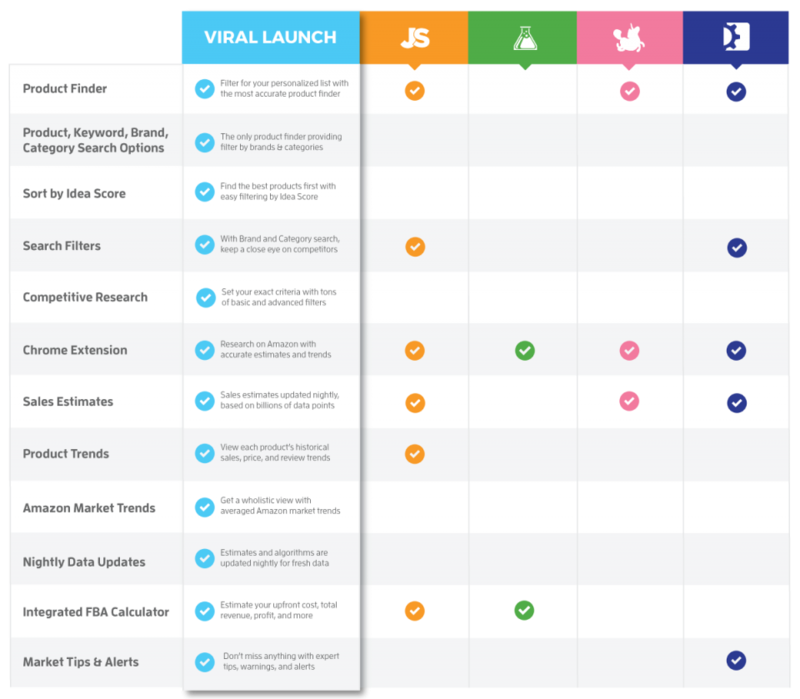 To help you do you in-depth product research, Viral Launch's Market Intelligence shows sales, price, and review trends across an entire market. You can use this data to see a product’s seasonality, if the market is declining, or how price has trended in the past. Google Trend graphs are included with Jungle Scout. While Google may help with understanding a market as a whole, it’s important to remember that Google is a search engine whereas Amazon is a marketplace. Searches are run with different intentions, so trends will differ on each site. There are countless ways to use Product Discovery. 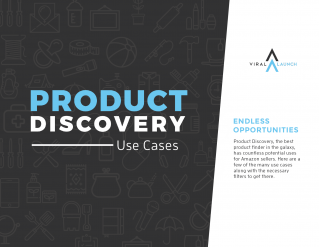 Product Discovery, the best product finder in the galaxy, has countless potential uses for Amazon sellers. Here are a few of the many use cases along with the necessary filters to get there. © 2017 Viral Launch. All rights reserved. Viral Launch utilizes billions of data points from running over 20,000 product launches. When it comes to Amazon sales and Jungle Scout vs. Viral Launch, we are the industry leaders. Try Viral Launch's Product Discovery and Market Intelligence for free to find and source your next home run!